JCB has promised better fuel efficiency, comfort and productivity with its revamped 411 wheel loader and the new 417 which will replace the existing 416 model. 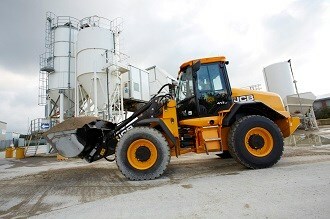 JCB's new 417 wheel loader will replace the 416 in the existing line-up. The upgrades include more fuel efficient JCB Ecomax Tier 4i engines, larger operator cabs and the availability of remote monitoring. The new JCB 411 now boasts a standard 1.4m3 bucket, a dump height of 2,624mm and a 81kW JCB Ecomax engine; while the JCB 417 features a standard 1.7m3 bucket, dump height of 2,728mm and a 93kW JCB Ecomax engine. Both models also feature a JCB Livelink system which allows machine information to be accessed remotely. JCB Construction Equipment Australia National Wheel Loader Product Manager Greg Sealey says the Livelink system offers improved security and makes it easier for operators to manage machine maintenance. "Information from Livelink, which is standard on these models, can be accessed online or by phone or email," he says. "Scheduled maintenance can be managed according to machine hours, and critical alerts can trigger a prompt response, with maintenance history available for background." Geofencing and curfew time features on the new machines can alert operator of unauthorised machine use, while operational information stored by the system can be retrieved to monitor and address inefficient use of a machine, such as prolonged idle time. JCB says the Ecomax engine achieves Tier 4i standard without the need for any form of exhaust after-treatment, and is more economical than the Tier 3 engine it replaces. "There is no requirement for a costly diesel particulate filter, no diesel oxidation catalyst and no need for selective catalytic reduction," Sealey says. "This means there is no need for a larger cooling system or additional maintenance-intensive items around the engine, so the loaders remain compact, with good sight lines from the cab." Both loaders employ a four-speed ZF automatic powershift transmission, with a clutch disconnect feature on the service brake to help operators save fuel and brake wear and prioritise power to the loader hydraulics. A viscous coupled engine fan on the machine that adjusts its speed based on temperature also helps save power and promotes reduced noise levels as it only operates as required. In addition, the models feature a redesigned ROPS/FOPS cab which JCB says offer greater space, operator comfort, reduced sound levels and good all-round visibility. A tilting and telescopic steering column is readily adjusted to suit operator preference. All instrumentation and alerts are integrated into a colour LCB screen mounted in the centre of the dash. On top of the redesigned cabs, both the JCB 411 and 417 loaders feature a new one-piece bonnet that tilts to provide ground level access to engine and cooling components for maintenance purposes. The loaders stocked in Australia will come with standard load arms, but high lift load arms can be supplied to order. A new super high lift arm option (2,928mm dump height) is also available for the JCB 417. "These loaders are equally well suited for council work, agriculture and civil contractors," Sealey says. "They deliver the latest emissions standard without compromising economy, reliability and maintenance costs." Click here to find JCB wheeled loaders for sale. Click here to look up JCB wheeled loader specifications.